During my Now Smell This years, many men have written me asking for a review of Hermès Rocabar.2 I'm wary! I assume the guys writing me love Rocabar; what if I don't? In that case would Rocabar fans prefer I keep quiet? Hermès is one of my favorite perfume houses so why was Rocabar unknown to me? Maybe I tried it ages ago and didn't like it? Was it just a case of Fate — Rocabar and I always just out of each other's reach? 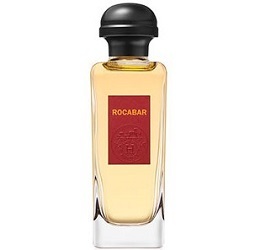 But last week, at the Hermès boutique inside my local Nordstrom, there was an easy-to-sniff tester bottle of Rocabar and I finally wore it. (This review is based on the current Rocabar formula; I assume late-1990s Rocabar was different). ...takes its inspiration from traditional horse rugs made in the Hermès workshops, with blue and red stripes on a saffron background.3 From the hand of [perfumer] Gilles Romey4 in 1998, Rocabar reveals its most powerful facets in tones of wood, balms and resins, underscored by the full-bodied notes of cypress in its sillage. Rocabar's opening is balmy, powerful and sweet; it has a Guerlain vibe. Rocabar starts with a waxy evergreen-needle aroma mixing with herbal lavender and spicy juniper berry. I do detect Rocabar's nutmeg-cinnamon, and they smell more bracing than edible. Ten minutes into its development Rocabar's cedar and cypress notes begin to take over; they are sticky, warm, intense and...cuddly. To me, Rocabar is more about evenings on the sofa covered in a fur blanket than wandering in wide-open spaces wrapped in your horse's rug. But that's O.K. ; warm woods and vanilla are always welcome. The extreme dry down is my favorite part of Rocabar: soothing wood smells, sheer vanilla with a hint of muskiness. After reading a large quantity of online reviews/comments about Rocabar it seems many men find it old-fashioned, "too much"...one commenter earnestly recommended it for "elderly men and women." Rocabar is certainly not a youthful or sprightly fragrance but I don't find it dowdy at all; it's a hefty (great sillage, 16-hour duration), HERE-I-AM perfume for bold fragrance (and bold-fragrance) lovers. Aside: The last several times I've gotten fragrance samples made for me at Nordstrom perfume counters I've noticed if I don't use the sample within a few days it goes "off" and starts to smell of plastic and chemicals. I assume this is the fault of the soft-plastic sample spray vials Nordstrom uses. My Rocabar sample from Nordstrom smelled great on day 1 but had altered so drastically by day 3 I could not use it for this review; I had to return for a new sample — taking along my own little empty glass sample vial. Nordstrom: I love your generous fragrance sample policy, but please investigate new sample vials! Hermès Rocabar is $129 for 100 ml Eau de Toilette. 1. All quotes via Hermès USA. 2. Listed notes of juniper berry, lavender, nutmeg, cinnamon, balsam, cedar wood and needles, cypress, vanilla. 3. See top-of-post images; you can still buy the wool horse rugs for $540. 4. Bernard Bourgeois and Jean-Claude Ellena are also listed as perfumers for Rocabar. Kevin, thank you for these insights (in-scents?). You’ve made Rocabar sound lovely, and as though it’s perhaps a friendly cousin of one of my favourites, Black Cashmere. I’m always looking to meet a new member of that family: do you think a woman could profitably wear R? Waterdragon…that’s a tough one…Rocabar smells manly to me…would you wear Dior Jules? Hermes Bel Ami? If so, you should give it a try. I think I could wear those, some days, and in some moods. Another for my expedition in Melbourne, then! Thank you. I love Bel Ami (own it) & Jules (used to…almost impossible to buy in Australia), but have never really fallen for Rocabar. I own a bottle (tragic Hermes fan), but it’s their fragrance I wear least. for the review Kevin. I didn’t notice this at the Hermes boutique in Charlotte, then again I wasn’t specifically in the men’s section. I have a hunch re the plastic vials. A Nordstrom SA, in the course of conversation, told me s/he sees the same customers come in repeatedly and fill 10 or 20 sample containers with product, then leave. The SAs have been instructed not to confront these “customers.” I wondered why they would absorb that kind of loss, leaving it unaddressed. It appears they’ve found a novel way of addressing it. Good heavens! I can’t fathom that people would behave like that! It’s really a refined form of theft. Siciliana…I assume Nordstrom just bought the cheapest bulk vials available. My Barneys NY uses glass vials for samples. I can’t even imagine the hutzpah of asking for 20 samples!!!! Hahaha! My Nordstrom used to leave large bowls of empty plastic atomizers for anyone to just take. They have since brought them inside the counter. hajusuuri: I remember the good old days when Nordstrom just put out manufacturers’ samples for anyone to take…bowl after bowl of goodies. Haven’t seen that in ages…. Kevin, I wear new the new version of Rocabar today, and I also wore the original Rocabr in the late 90’s. The new formulation is still delicious, but the tenacity of the old version was much stronger and wore like a veil of everything that you would ever would want to smell like. Today’s version on me wears like an endless skin scent. Very subtle to my nose, probably quite pungent in sillage to others. I do enjoy how Rocabar scents my sheets when I go to bed and whatever t-shirt I was wearing while lounging around on the couch in continuously smells of Rocabar until laundry day. Equipage, Bel Ami, and Rocabar are the only Hermes fragrances I wear anymore. I really tired of all of the other offerings. I am tempted to try the new Bel Ami Vetiver that you reviewed sometime ago. I almost purchased it when I walked by Hermes on Madison around the time of BAV launch time but for some reason I did not buy it. I may have to check it out eventually. Lindeberg…I was tempted to buy a vintage Rocabar in the cute little horse rug slipcase…maybe I will now! It’s true, Kevin, I was quite disappointed when you did not love Caron Troisieme Homme as I do. Not for me, but for you. FYI to anyone who does love Third Man: try April Aromatics Erdestern for a more nuanced version. Noz…I think I have a sample of that…I’ll search and try it. I’m considering a purchase of Erdentern at Twisted Lily. If there is a special deal for Sniffapalooza attendees, it will likely go home with me. I’m really liking these April Aromatics, but they are expensive. A discount would be a big plus. Still trying to figure out which one I like best. Dusan…a tie between Equipage and Bel Ami? More like between Bel Ami (I must try the flanker!) and Rocabar, with Equipage as a close third. I still own a large bottle of the original. Neiman’s had a special 600 mL bottle with the rug for Christmas in the late 90’s and I bought it. To me in addition to all the notes listed, there’s a lingering iris note that lasts on my skin. Funny story: I was in Turkey on business and was wearing my vintage Rocabar. Took a cab in Istanbul on a beautiful sunny spring day and while dropping me off, the driver says in rudimentary English: Sir thank you for the tip but can I ask you a question please? I said yes. I have to say that not many scents I wear gather compliments from men who are total strangers or taxi drivers. BTW: I bought my Hermes Rocabar blanket at Hermes Brussels in 2002 for 140 Euros! Best investment I’ve ever made. But boy that wool is itchy! It wasn’t meant to be cozy as a blanket for humans. It was made to cover horses at night! Eric: I was “itching” to buy one of those blankets! Thankfully you commented! It is SO rare for men to ask what you’re wearing…I can certainly see Rocabar going over well in places where perfume is worn all the time. Wonder what happened to that iris? I’ll have to try the vintage version for sure. I am ignorant of Rocabar, but loved the review. Excellent review as always, Kevin! A new Rocabar with a touch of rose would be lovely. AnnE: thanks…I think I’ll try layering it with Une Rose and see what happens.